As we all know admission process for NIOS DELED 2 year programme has been over and IDENTITY CARDS have been issued to all successful registered candidates which can be downloaded online from NIOS website. Till now there was not any Official declaration regarding changes to made by candidates in their submitted details or who wants to cancel their NIOS admision and needs fee refund in case of double amount deducted. But Now the candidates which are willing to cancel their NIOS DELED admission for any reason can request for admission cancellation and fees refund in case of double amount deducted during application process. Candidates who submitted wrong details in their NIOS DElED form while applying online can also request for data correction. NIOS Chairman told in his message about all the steps and procedures to be followed for NIOS DELED candidates relating to study material (semester books), admission cancellation procedure , correction in deled data submitted to NIOS and Fees refund (if payment is done more than once) also. If you entered your school UDISE code wrong by mistake you can correct it by logging in teacher registration section with your login email/mobile number and password and then click on update UDISE code by entering new UDISE code. As per the NIOS chairman message, NIOS candidates who wants to cancel,correct or needs fees refund have to send an email with their details regarding their issue. IF YOU HAVE ANY PROBLEM OR QUERY REGARDING DELED ADMISSION PLEASE ASK IN COMMENT. Mujhe up btc ki details chahiye. 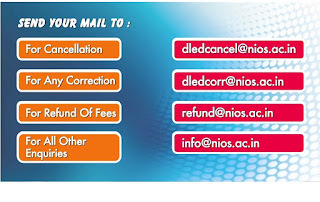 For cancellation and refund kindly send a mail with your admission details to dledcancel@nios.ac.in . for complete direction please watch the NIOS chairman message in video given above in post. I would like to inform you that nios has released the list of cancelled admissions and refund list, kindly check your name in those list. RESPECTED SIR, MY COMPLAIN REF-TICKET ID IS-01436275.COMPLAIN MAIL TO CITRUS TEAM.LAST TWO MONTH AGO,BUT TILL TODAY NOT RETURN MY MONEY. Hello .. I want to inform you that please contact to your bank customer care through call and tell them about this problem. 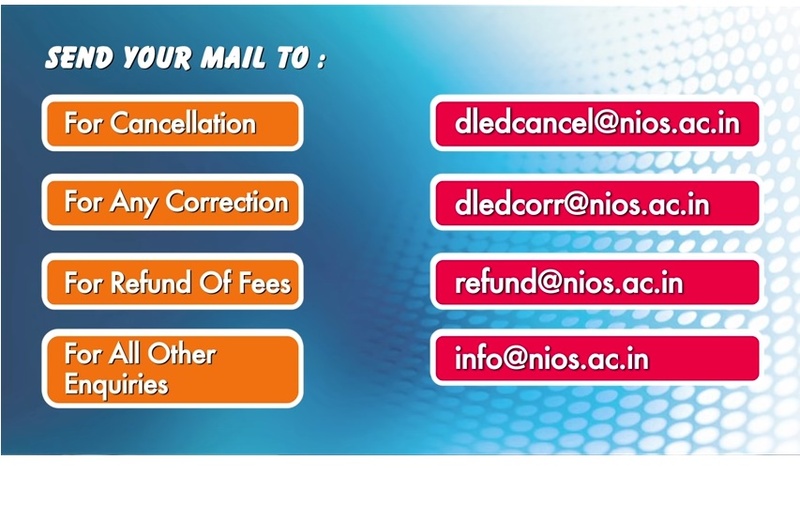 If you have already sent mail to nios for admission cancellation or refund request you can check your name in the refund list, given on nios deled website under teacher section. While filling the form by mistake i have filled the medium of instruction as English instead of Bengali. Please let me know the procedure to correct the medium. Please help me without medium changing i will not be able to rite the examination. Moreover,i have wrote a mail to NIOS and also contacted the but no response. Please help. Hello sir/mam , I can understand your concern, I would like to suggest you that please contact to your study centre coordinator in this mayter, only they can guide exactly what can be done now. And as per information there was no detail about medium to be chosen during form filling. So kindly confirm with your srudy centre coordinator whether they are providing question paper in local state language. Hello mam, as per nios instructions last date for cancellation , refund request , correction was up to november 2017 , if you had sent mail after november , then they will not accept your mail. And if you have correctly mailed them your details within time limits then surely they had cancel your admission. As per your problem may be you were not able to provide all information regarding cancellation that's why I think admission not get cancellation. Now you can contact to the study centre for more info. I have no printout copy of D.el.ed registration form (NIOS admn. form).It was saved in my computer but unfotunately it has deleted. (1) How i can reprint it ? Is this requires in correction of date of birth. (2) How to correct date of birth ? For this issue kindly contact with study centre and state coordinator. Sir , have you paid 504 505 exam fees ?? Second year fees was meant for 506 to 510 . To get admit card you have to submit exam fees. My two extra transactions are failed I e. 1210 amount.I have mailed hundreds of time. There is no any response from deled. And bank is saying money is paid to merchant ofoall three transactions. I made transaction on 4 July. It is highly disappointing what would I do now. Sir/mam , it cannot be cancelled . And there is no problem with 509 or 510. As you pair for 509 now prepare for it without any doubt or confusion.